•5 pin or 3 pin male and female XLR connectors. 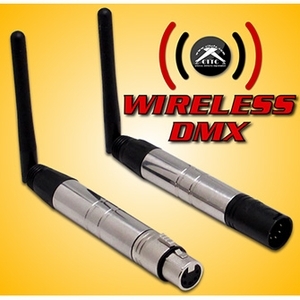 •Go cord-free with wireless transmission of your DMX signal! •Full 512 DMX channel coverage! •Wireless transceiver with FHSS technology ensures interference is kept to a minimum. •2.4G global open ISM band with license-exempt use. •126 band frequency hopping to automatically select the band with least interference. •Single interface protocol (no crossovers). •Able to communicate with multiple receivers.